And now she okays the U.S. to increase America’s German-based nuclear arsenal against Russia. Verbrecherische isn’t the first instance of Merkel’s loose lips sinking her own ship. Last November she picked more aggressive German for impromptu remarks than were set down in the chancellery’s script. But that was in Australia, and Putin had already left the country. Merkel isn’t the only politician to say things in Australia which don’t count in the rest of the world. By “reasons behind”, Putin and Lavrov meant Nuland and the Washington war party. Ahead of the Sochi meeting, the State Department spokesman had tried to play up Kerry, and downplay Nuland. “You can’t deal with diplomatic issues if you don’t do diplomacy,” the spokesman declared on May 11. On May 13, the spokesman was asked if “United States is ready to put pressure on Ukraine to fully implement Minsk II agreements”, and ducked the question. Nuland’s version, according to the US Embassy transcript, was to emphasize just how “eager [we are] to deepen our involvement in helping the parties achieve full implementation—everything from complete ceasefire and pullback on the line of control, to the political pieces, to the border pieces.” By “political pieces” Nuland meant the constitutional changes for eastern Ukraine Putin insists on and Kerry mentioned, while Nuland bit her tongue. Instead, the US Treasury rolled out its former Secretary, Lawrence Summers, to announce that the International Monetary Fund (IMF) “has done as much as can reasonably be asked”. Summers, on the receiving end of Ukrainian oligarch Victor Pinchuk’s treasury (right), is this week omitting to call for fresh European Union money or contributions from the Ukrainian oligarchs. 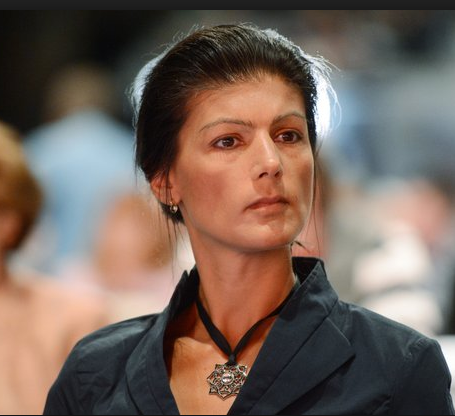 Speech in Bundestag by Sahra Wagenknecht. Mr President, honored ladies and gentlemen, Frau Chancellor. that nationalism and strife in Europe, during your ten years in office, are thriving like never before, and as regards Russia, a policy of outreach has given way to a new Cold War. Not long ago, the head of the influential think-tank Stratfor, with striking bluntness, explained the US interest in Europe: The chief interest of the United States is to prevent coordination between Germany and Russia, since, literally “united they are the only power that can threaten us,” i.e. threaten the US. This perceived threat to US interests has been achieved successfully for the foreseeable future. That started as the EU tried to get countries out of their economic and political cooperation with Russia in the framework of the Eastern Partnership. Frau Merkel, naturally this was aimed at Russia, but it was also contrary to the interests of the countries involved. You, not Russia, pushed them to the either-or. Resultantly Ukraine has lost the great part of its industry. Today, the country is a bankrupt state, where people go hungry, shiver, and have salaries lower than people have in Ghana. But the confrontation with Russia has not only destroyed Ukraine, it has damaged all of Europe. It is, in fact, an open secret that the United States is stirring the conflict with Russia on economic grounds. When the US administration talks about Human Rights, they’re actually meaning drilling rights or mining rights. Right now in Ukraine there is in view a hell of a lot of shale gas to frack. If now, in the framework of the Energy Union of other pipeline routes, we’re talking increasing independence from Russian gas, then you should tell the people in honesty what that means: increasing dependence on much more expensive and ecologically devastating US fracked gas. I do not consider that a responsible view. The list is long, Frau Merkel, of earlier chief politicians who criticise your Russia policy. In that list we find the names of your predecessors Gerhard Schroeder, Helmut Kohl, Helmut Schmidt, and even Hans-Dietrich Genscher. Perhaps this is what led to your backing off. In any case, it is correct, that you, with French President Hollande, took the initiative: Minsk II has really led to significantly fewer deaths there in recent weeks than in the weeks and months preceding; the door to a peaceful solution has been opened. This is naturally an important new situation, and you, Frau Bundeskanzlerin, and the French President deserve recognition. However, the person that the peace and security in Europe depend on must now go forward, with follow-through, and with backbone. This is naturally a problem, since follow-through and backbone haven’t exactly been your strong suit. but when Ukrainian troops — or the Nazi battalions fighting for them — keep right on shooting, then it is quite less unacceptable, and no critical word from you is heard. Why do you not come forward with words of censure when the Ukrainian regime, notwithstanding its foreseeable bankruptcy, budgets four times as much for arms as it did last year? This doesn’t assure us that the road to peace has any actual support in the Ukrainian regime! Furthermore, the US and Britain sending military advisors and delivering weapons is not a matter of supporting the peace process, but of torpedoing it. But do you now envision sanctions against the US and Britain? I believe that this whole business of sanctions was a huge mistake through which Europe shot itself in the foot. The sanctions should not be extended. We do not need any more tanks. We do not need a 3,000-man NATO intervention troop in Eastern Europe, that protects nobody, but instead puts all Europe further at risk. Helmut Schmidt got it right when he warned already in 2007, that, when it comes to world peace, there is far less risk from Russia than from America, and that NATO is only a tool for maintaining US/American hegemony. And if that is correct, then we are left with one set conclusion: that Europe must finally make policy separate from, and independent of, the United States. Mr Juncker has put forward the thesis, that we need a European Army to show that we are in earnest about defending European values against Russia. This shows just one thing, how very far we have come from what the founding fathers of European Union wanted. Back then it was all about — as you yourself have often said — peace, democracy, and solidarity. Never again should nationalism and hatred separate the lands of Europe. But to defend these values, no armed battalions are needed! If you want to defend democracy, Frau Merkel, then see to it that the lands of Europe are at last ruled by elected governments rather than financial markets, not by the one-time investment banker Mario Draghi, and, further, not by you. If you want democracy, then stop the so-called Free Trade Agreements, stop the TTIP that would make elected governments just a farce. That would be the defending of European values! That would be a defence of democracy, exposing these unspeakable TTIP negotiations and comparable dealings. If you want to see a unified Europe, then stop humiliating other countries and imposing programs that rob the young generations of their future. Stop prescribing so-called structural reforms in Europe, that only lead to growing inequality and an ever growing low-wage sector. Here in Germany meanwhile, in consequence of these policies, three million people, in spite of having a job, are so poor they can’t stay warm, haven’t enough to eat — let alone afford going on a vacation! Instead of trying to explain this export-bashing policy, it is high time — and very much in Europe’s interest — to correct it. And it is not least the German wage-dumping that is stifling the other countries of the monetary union. So one can only say “That would be good” well, that would be a good thing when the German government could only experience its own rendezvous with reality. Because it was not Syriza, but instead, the sister parties to the CDU/CSU and SPD that over the decades stacked up the huge deficits, so that they and the upper crust could stuff their pockets. The reality is also that under the protectorate of the troika that you still treasure so much, whose criminal activities you can see in the documentary by Harald Schuman, the Greek debt just got bigger and the Greek billionaires got richer. And if you want our money back, get it from those that took it, and that was not the nurses, nor the Greeks on pensions: it was the international banks and the Greek Upper Crust. It’s from these you could help the Greek government recover its money. Who advances credit to one already overloaded with debt will never see his money again, but the responsibility is on you, Frau Merkel, and you, Mr. Schaeuble, and not on the new Greek government which is now hardly two months in office. As for the whole debate over possible reparations, I can only say that, no matter how the question gets juridically evaluated, the least one should expect from the German State is some minimum of sensibility in dealing with the issue. I must say, you still laugh. That is sad. In view of how German occupiers ravaged Greece, and that a million Greek men and women lost their lives in this dark chapter of German history, I find the flip remarks from you, Mr. Schaeuble, and from you, Mr. Kauder, simply disrespectful, and I am ashamed. Yes, only when we remember, and only when we respect each other — only then will we get back a policy of being good neighbors, both inside the EU, and with Russia.